Everyone wants to live a long, fulfilling, and healthy life, but it takes hard work, focus, dedication, and a little bit of luck to succeed. As part of the POPSUGAR Insights 2014 Healthy Living Report, we wanted to speak to women to understand the kind of expectations they set for their own lives by asking them how old is old and how long they expected to feel their best. We provided women with options that ranged from “my 30s” to “100 years or longer,” and the results were extremely interesting. According to the women we interviewed, old begins at 50-plus. Among all women, 84% selected an age of 50-plus as being “old,” with 31% specifically selecting the range of 61-70 as their definition of old age. The years of 51-80 are the “sweet spot” for being considered old, with 69% of women selecting an age within that range. Looking across the USA, women in the East, Midwest, and South all considered the ages of 61-70 to be old, while women in the West skewed older, selecting 71-80 years as being considered old. Now that we knew what women consider old, we were interested in learning how long women expected to feel their best. Overall, the highest individual percentage of women said that they expect to feel their best up to their 50s (20%), followed by their 40s (18%) and their 60s (17%). 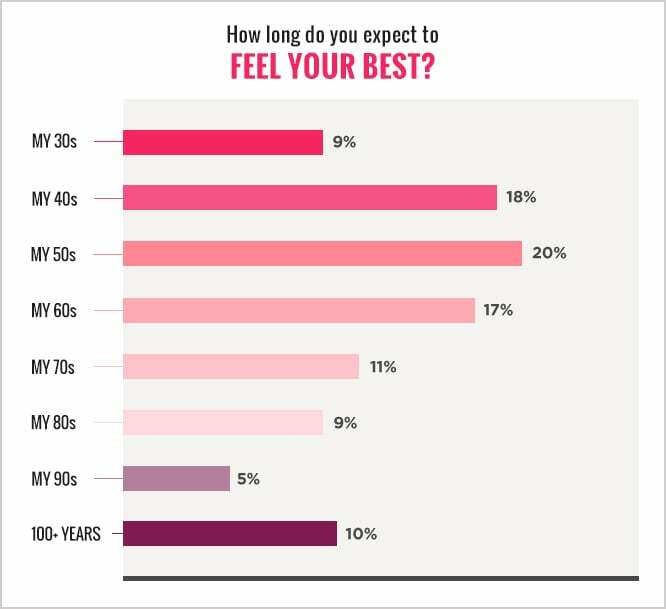 Eleven percent of women said they expect to feel their best up to their 70s, and 10% of women said they expect to feel their best up until they reach 100 years or more. Female Hispanics responded that they expected to feel their best in their 40s (21%) and their 50s (21%), and 25% of African-American women said that they expect to feel their best when they reach 100 years or more. Marketers should seek to take advantage of these trends to expand their content to focus on longevity programs and share other ways women can stay fit, stay young at heart and feel their best later in life.